Top 11 things your should go put in your car for RIGHT NOW! It doesn’t matter if you are traveling from Lake City to California, or from your house to the Publix down the road, roadside emergencies happen all the time. Over the years we have seen times when a little emergency preparation would have saved motorist time, a little comfort, a lot of money, or even could have saved someones life! We highly recommend putting the following items in your vehicle today. The owners manual of your car has a lot of neat things that are of use to the towing company or repair shop working on your vehicle. The owners manual will have information on the correct pressure to keep your tires at, how to put your vehicle into neutral with a dead battery, information about jump starting your vehicle, and instructions for a tow truck driver on where to hook a car up to be towed. The owners manual is generally located in your glove box, however if you bought the car used without one, often times you can find a replacement on Ebay for cheap! Living in Florida, it is easy to forget that it occasionally gets cold here sometimes until the night your car dies on the interstate in 20 degree weather. Keeping a blanket or a survival blanket in the car also could come in handy if you ever needed to change a tire in the rain and needed to warm up and dry off. Much like keeping a blanket in the car, if you ever had to change a tire in the rain, it would be nice to have a nice set of dry clothes to change into while on a trip. If you own an older vehicle it is a good idea to keep a set of jumper cables in your car in the chance of running into a dead battery due to heat. While we will gladly give your car a jump start, often times people will be glad to give you a hand and get you on your way down the road. If you own a newer car, sometimes the manufacturer will suggest not to jump-start the vehicle. AAA Auto Club makes some nice heavy duty jumper cables you can keep in your vehicle. Keeping an eye on your air pressure can help prevent damage from a punctured tire which could lead to severe tire damage or a blowout. 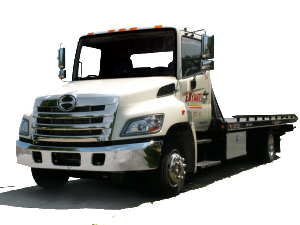 If your tires do appear low, call your local friendly tow company; we have trucks that can air the tire back up, or change it out with your spare. This nice digital tire gauge is only 13 dollars, and will provide you with extremely accurate readings on your tires. Keeping a flashlight handy in your car can come in handy for a lot of problems such as dropping your keys getting out of the car, checking your tire pressure, or jump starting your car in the dark. Here is a cheap LED Emergency Flashlight to help you out in a bind. Keeping some emergency money in your car could be very beneficial to you if you need to have your vehicle towed. Most autoclubs have a limit on mileage you can use at a time, so if you are out of town, an extra 20 bucks could make the difference of getting home, or having to visit an auto repair shop in another town. If your vehicle breaks down on a dangerous part of the interstate (top of a hill, or in a low spot with heavy fog), it would be advised to light a road flare and or place reflective triangles to let traffic know where you are. This will also make it easier for a tow truck to find your vehicle in the case that your battery dies and you can’t leave your lights and flashers on. Here is a reflective triangle set from AAA Autoclub that you can use. 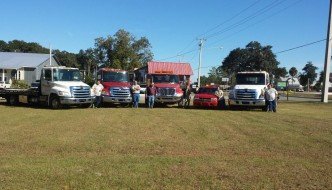 Towing for 35 years, we have seen countless vehicle fires that may have been preventable if someone had used a small fire extinguisher to put out the flames before the fire consumed the car. There are small canister options available if size is a concern that will fit nicely in your tool kit or next to your spare. Accidents happen, and keeping a first aid kit in your car handy could help save your life or someone elses.